Bradley Mongold holds the FKT for the Allegheny Trail, 4d13h33m, August 2008. 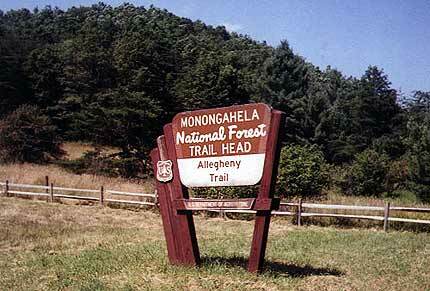 The Allegheny Trail runs from the West Virginia-Pennsylvania border near Bruceton Mills to the Appalachian Trail on Peters Mountain, north of Pearisburg, Virginia. The trail appears to be under construction, and will eventually be 330 miles long. I was by myself, got stuck when the mountain tops had been clear cut and trail markings gone with the trees, had to backtrack 6 miles on trail, and about 35 miles on road(some of which I hitch-hiked) to locate my crew, go in backwards to cover what I missed and then out again, then had to drive to find where the trail picked up for the final section, ran that and had only about 3 hours day light left for the last 12 miles. Sounds doable, right? But with no confidence in the trail marking, I decided to wait until first light. In retrospect, it took me 6 hours in the daylight. Would have been impossible in the dark by myself. Such is trail running...hence, a very, very soft "record"... Almost to the point of embarrassment.